We all are very much dependent on electricity to perform our daily life chores, that any problem with the electrical system can create havoc in our lives. Handling power related issues without having any prior knowledge could be dangerous. Here comes the need for skilled electricians well trained for testing, fitting and repairing wiring and circuits, who can handle any malfunction in the electrical system. Profession as an electrician involves a lot of hard work and dedication with utmost sincerity and perfection. It is a job which is full of risk, i.e. a little mistake or carelessness in the line of work could be fatal. Moreover minor injuries such as burns, shocks and falls are common. Anyhow electricians are always in demand because of the flood of construction of buildings, flats, homes, etc. For any construction, electricians install new electrical circuits and wiring systems after structural work is completed. Though profession of an electrician is not considered as the most sort after one, it has a lot of opportunities in India and abroad. Jobs are plenty, more so as the availability of skilled workers is less than the demand. Electricians from Asian countries have great opportunities abroad since these professionals are considered to be more hardworking, efficient and above all are available at reasonable salaries. No formal educational qualification is needed for a career as an electrician. Anyone with an intensive knowledge of electric circuits and other basic operations of electrical appliances can work as an electrician. One can start off their career as a helper with an experienced electrician, and acquire the required specifics within six months to one year. Then with years of practical experience, they can become a skilled electrician. But it should be noted that in every organization, opportunities are mostly open for those who have received professional training. So to work as an electrician in a reputed public or private organization, one must enroll for an electrician trade course in Industrial Training Institutes (ITI's). IIT's are located in almost all the states of India and the minimum educational qualification for applying for electrician trade course is Matric/ 10th. The course is offered as engineering trade and the duration of the course may vary from 1-2 years. During electrician trade training course, students are taught lessons about all possible types of electrical problems which could happen in an industrial setting or a household. The course curriculum combines classroom instructions on electrical theory, installing and maintaining electrical systems as well as on-the-job training under the supervision of experienced electricians. During on-the-job training, initially they drill holes, set anchors and attach conduit. Later, they measure, fabricate and install conduit, as well as install, connect, test wire outlets, and switches. They also learn to set up and draw diagrams of the entire electrical system. At the end of the course, the candidates become adept to carry out the work done by an experienced electrician. An electrician must have good manual dexterity and eye-hand coordination. They must be physically fit and have a good sense of balance. Good color vision is needed because workers frequently must identify electrical wires by color. They should have the ability to interpret technical diagrams which represent the structure of the electrical circuit. Strong troubleshooting skills allow an electrician to figure out the cause of problems and the best way to fix them. After obtaining a certificate/ diploma in electrician trade, one can start their career as an apprentice under an experienced electrician or an established firm. To excel as a skilled electrician, lots of practical work experience is required. Opportunities are good for those with a wide variety of skills. Repairing electrical problems by replacing faulty parts and components. Planning, layout and installation of electrical wiring, equipment and fixtures from fans, bulbs to motors, generators, air-conditioning, electric engines etc based on job specifications. diagnosing electrical problems by studying diagrams, manuals, and specifications, troubleshooting systems and conducting tests. installing feeder and branch conduit and wiring. Electricians generally specialize in construction and maintenance work. Construction work include reading blueprints, wiring, installing and testing electrical systems. While installing an electrical system, electricians use technical diagrams (blueprints) which shows the location of the circuits, outlets, load centers, panel boards and other equipment for installing the wiring system. These diagrams will help them to connect the wires to circuit breakers, transformers, outlets or other systems. After installation, they ensure that the circuit has proper connections, electrical compatibility and safety with the help of testing equipments such as ammeters, ohmmeters, voltmeters and oscilloscopes. Construction electricians are employed by contractors during the secondary phases of building. Maintenance work involves troubleshooting, testing and fixing already installed, improperly functioning, electrical systems. Electricians specializing in maintenance work primarily maintain and upgrade existing electrical systems and repair electrical equipment. Maintenance electricians work as freelancers or for large factories, office buildings or hospitals. Openings are available for skilled electricians in the areas of electrical and building firms, hospitals, electrical manufacturers, power generating companies, home appliances companies, engineering companies, rigs, as light man (gaffer) in films and advertisement commercials etc. A gaffer must have mastery in the usage of various lighting equipments to suit the requirements of director of Photography. Electricians with specific specialisations can work with renewable technology, such as wind turbines or photovoltaic systems that turn the sun's energy into electricity, waste water treatment etc. In the government sector, opportunities are available in railways, electricity board, Indian oil rigs and companies, Telephone Department, Airport, etc. To obtain government jobs, one has to take the PSC examinations conducted by Public Service Commission in the respective areas. An electrician also has the option of self-employment. 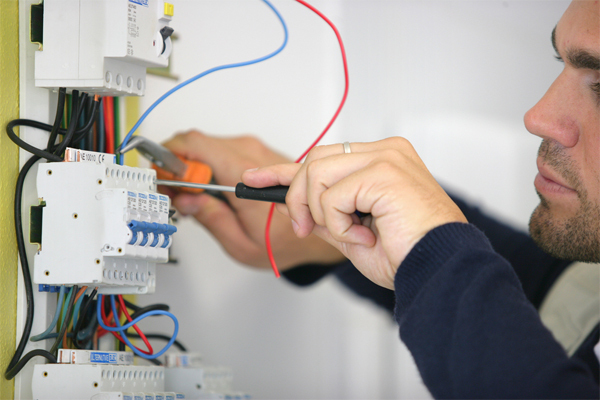 Experienced electricians can become a supervisor of a project. With sufficient capital and management skills along with an electrical contractor's license, one can start up their own business and become electrical contractors. The remuneration of an electrician depends mainly on the kind of project they are working for. At the initial stage of their career, those who working for organisations can start with a salary of Rs.6000- 8000 per month. With experience they can earn anywhere near Rs.10,000- 12,000. Pay scale of self-employed electrician can be much higher than those who work for companies. Those who working in corporate houses as resident electrician one expect much more in term of monetary values as well as other facilities.